Life has been so busy lately that I haven’t had as much time to play with the ancestors. We moved into a larger house and moved mom in with us. Of course all of the moving things around in a house lived in for 50+ years was bound to uncover something. In the back corner, on a shelf, in a room that I grew up in long ago, I found an old blue box and dragged it out, dust and all. When I peaked into the box, from my doubled up position under the eaves, I spotted what looked to be an old photo album. I put the box into a pile I was building to take downstairs for further inspection. Once I got the top off the box, I realized that I had found my grandfather’s old photo album; including pictures of my grandmother holding my mother as a baby. What really surprised me, tucked into that box, was a glass negative from my great great grandmother’s collection. Mary Zuver West, 1851 – 1936, was a professional photographer in Bradford during the late 1800s to early 1900s. She learned the trade from her husband, Jacob West, whose German uncle Francis Eyth continued the family business of photography in the states once settling here from Germany in the mid 1800s. Francis had a photography gallery in Butler for years before engaging in the hotel business in Slippery Rock. Mary was known for her photographs of women and children. 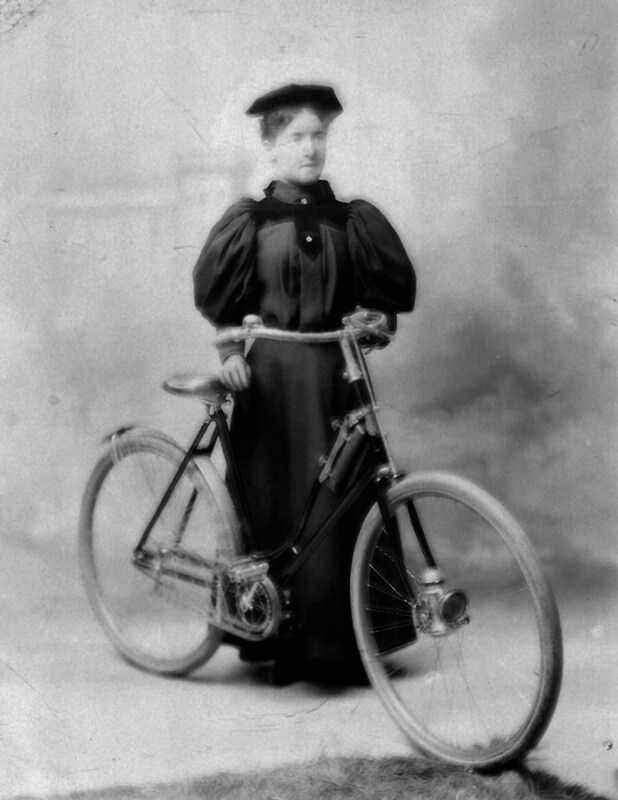 This photo shows a woman with a bicycle. My grandfather had pulled it from the rack of old negatives and had inserted it in the box of family photos. I wonder if the reason he had kept it out was because of the interesting composition or if it was a family member.